Word (meaning "height") of frequent occurrence as an element in the place-names of the mountain districts of Palestine; as, Ramath-lehi; Ramath-or Ramothnegeb; Ramathor Ramoth-gilead; and Ramathmizpeh. It occurs also in the form of Ramathaim. In addition, there are a number of different towns designated simply Ramah. 1. Ramah in Asher (Josh. xix. 29): Probably the present Ramiya, southeast of Tyre, a small but very ancient village. 2. Ramah in Naphtali (Josh. xix. 36): Fortified place, probably the present Er-Rameh, 12 kilometers southwest of Safed, and favorably situated in a well-watered region. 3. 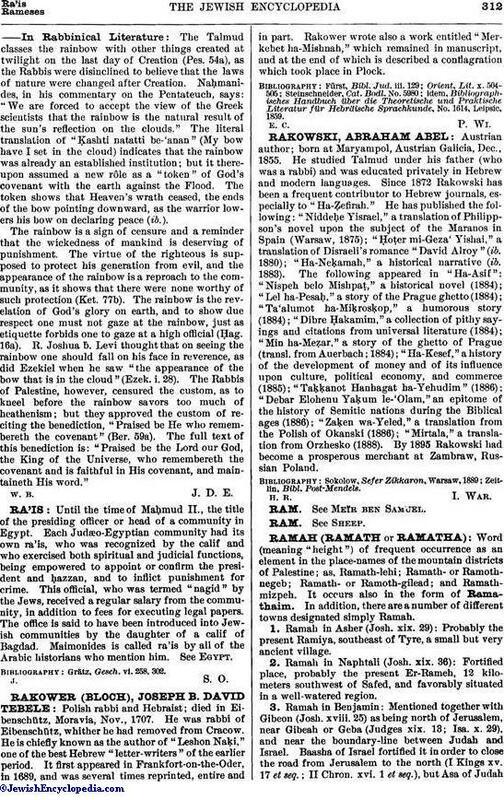 Ramah in Benjamin: Mentioned together with Gibeon (Josh. xviii. 25) as being north of Jerusalem, near Gibeah or Geba (Judges xix. 13; Isa. x. 29), and near the boundary-line between Judah and Israel. Baasha of Israel fortified it in order to close the road from Jerusalem to the north (I Kings xv. 17 et seq. ; II Chron. xvi. 1 et seq. ); but Asa of Judahimmediately razed the works (I Kings xv. 22). According to the "Onomasticon" of Eusebius, it was 6 Roman miles from Jerusalem, opposite Beth-el. It undoubtedly corresponds to the present village of Al-Ram, on the road from Jerusalem to Nablus, and 9 kilometers north of Jerusalem. Reference to this Ramah is intended in Jer. xxxi. 15, Judges iv. 5, and Hosea v. 8, although it is a moot point whether it is identical with the birthplace of Samuel (see Ramah No. 4). 4. The native place of Samuel. In I Sam. i. 1, the place is called Ramathaim, but elsewhere Ramah; the Septuagint, however, always uses the first form. According to I Sam. ix. 5, Samuel's home lay in the territory of Zuph, so that his father is called a Zuphite (see Ramathaim-zophim); the addition, "of Mount Ephraim," shows that this territory and Ramah were situated on the mountain of Ephraim, in the southern part, on the frontier of Benjamin. In like manner, it is clear from I Macc. i. 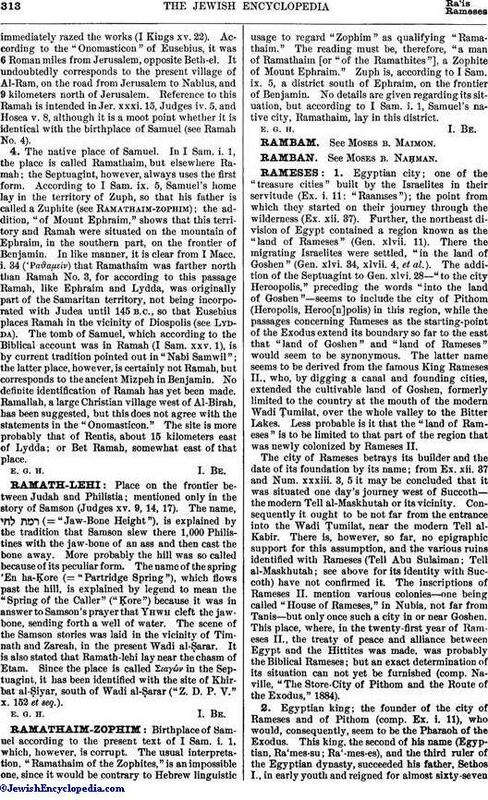 34 ('Pgr;αϑαμείν) that Ramathaim was farther north than Ramah No. 3, for according to this passage Ramah, like Ephraim and Lydda, was originally part of the Samaritan territory, not being incorporated with Judea until 145 B.C., so that Eusebius places Ramah in the vicinity of Diospolis (see Lydda). The tomb of Samuel, which according to the Biblical account was in Ramah (I Sam. xxv. 1), is by current tradition pointed out in "Nabi Samwil"; the latter place, however, is certainly not Ramah, but corresponds to the ancient Mizpeh in Benjamin. No definite identification of Ramah has yet been made. Ramallah, a large Christian village west of Al-Birah, has been suggested, but this does not agree with the statements in the "Onomasticon." The site is more probably that of Rentis, about 15 kilometers east of Lydda; or Bet Ramah, somewhat east of that place.